Every stage of life is unique, and nowhere is this more apparent than in the journey we all take in “becoming us” — our adult selves. The process of growth and development is complex and shrouded in magnificent mystery. As time and science unveil the mysteries of growth, it is the responsibility of parents and healthcare professionals to shepherd our children, to make sure that they are nurtured and grow into the next generation's healthy mature adults. Monitoring growth and development, preventing and intercepting disease along this road, is the mission of pediatric dentistry. This dental specialty strives to ensure the oral health of infants and children through adolescence to the completion of growth — including children with special healthcare needs. Children's needs extend beyond oral and dental health to include general health, for they are inseparable and interconnected. Healthy growth and development lays the foundation for the rest of one's life, both physically and emotionally. We will review the topics involved in the changing life cycle of children's oral and dental health, from birth through adolescence to adulthood. It is a real metamorphosis. The Surgeon General of the United States has stated, “You can't be healthy without oral health.” And you can't have good oral health without good nutrition. Mother and child embark on the journey of new life together, which begins with the mother's healthy diet and nutrition for her developing baby. This changes into meeting the needs of the growing child as a separate entity, and again as the child grows and becomes independent. Nutrition affects growth and development, and of course the mouth is the conduit through which it all takes place. We need good nutrition and dietary practices throughout life for the formation, development and continued health of our oral tissues and structures, as well as those of the rest of our body. It's not only about what's healthy that goes into your child's mouth, it's also about what's unhealthy. The relationship between tooth decay and sugars, refined carbohydrates (or added sugars), consumed throughout the day is well known. Neutral pH is 7 (pH is a measure of a fluid's acidity at 1-7, and alkalinity at 7-14). 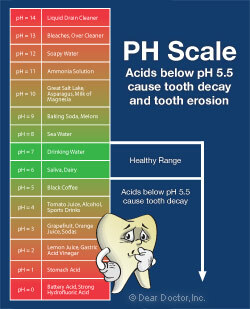 Tooth decay begins at pH 5.5, in the surfaces of the teeth called pits and fissures (the nooks and crannies on the biting surfaces) and at the points where adjacent teeth contact each other — all protected areas that are difficult to clean. 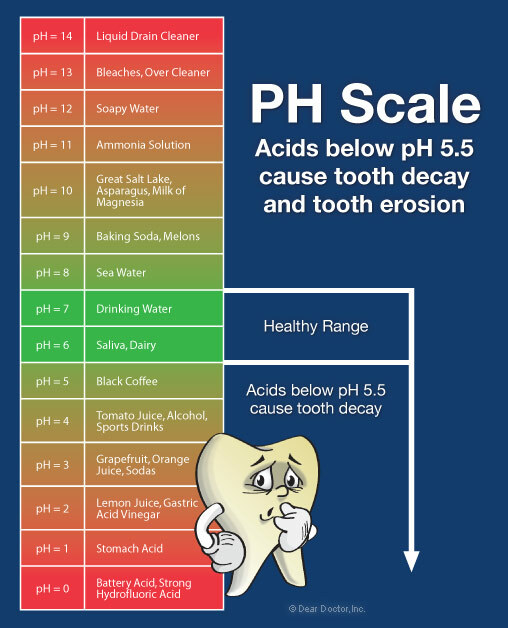 What is not so well known is the impact of sports drinks and sodas that have low pH values in the 2-4 range (read that as high acidity). They are causing an increased incidence of enamel erosion, which can affect the whole tooth surface. Gastro Esophageal Reflux Disease (GERD), a condition caused by acid regurgitation from the gut (pH 1, severe acidity), is a primary cause of tooth erosion, a literal dissolution of the protective enamel, and underlying dentin in severe cases. Erosion caused by GERD can be seen in early childhood and on erupting permanent teeth, but it may also abate. It is not uncommon to be able to tell when tooth erosion occurred by the teeth affected, and by its severity. Similarly the psychological stress-related conditions of bulimia (“bu” – ox-like; “limos” – ravenous hunger) and anorexia (“an” – without; “orexis” – appetite or desire) are associated with bouts of vomiting, which can result in severe acid-induced tooth damage, especially in teens. Described as “one of the ten most important public health measures of the 20th century” by the Centers for Disease Control and Prevention, fluoride in the right place, at the right time, and in the right amount has a 50-year scientific research and safety record proving that it makes teeth stronger and more resistant to dental decay. When it is added to public water supplies at the current recommended levels of 0.7ppm (parts per million), it is incorporated into developing tooth structure. Almost 200 million Americans are drinking fluoridated water, which also means that 100 million do not have the advantage of this amazingly safe and cost-effective health benefit. 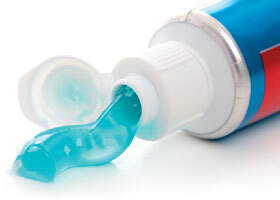 Fluoride can also be applied topically in the form of toothpaste, rinses, varnishes, sealants and by other means — which allows it to be incorporated into the enamel surfaces of the teeth with similar effect. When is enough enough, or even too much of a good thing? We answer this question and more in our consultation on supplemental fluoride and infant formula. 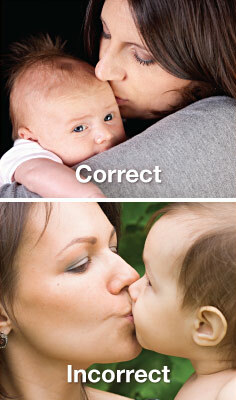 Kissing your infant on the lips transfers your bacteria to your baby, which has the potential to cause tooth decay. Clearly, physical growth and development, which occur before our very eyes, are accompanied by rapid change. Emotional development, brain function and learning are part and parcel of growth, and learning is a fundamental part of healthy lifelong habit formation. The Age One Dental Visit — a visit to your pediatric dentist as soon as a baby's first teeth appear — is an integral part of these processes. It is vitally important to establishing a relationship and a dental home. And you may well need it as your baby starts teething, which can be a trying time, not only for your baby, but for you too. Our excellent consultation on teething may be a sleep-saver for both your baby and you. If teeth aren't problems when they're coming in, they may be problems when they're going, as you will doubtless learn as you read on. Learning and establishing healthy habits is a fundamental platform upon which lifelong oral health is based. Age-appropriate oral hygiene aids and products are critically important to habit formation, especially for children with special needs. All children should learn to remove the bacterial biofilm that daily collects on teeth and is a major cause of tooth decay and gum disease. Good oral hygiene is also about preventing transmission of decay-causing bacteria from parents and caregivers to children — your child's oral health is therefore related to your own. Sharing eating utensils with your baby or licking pacifiers to clean them encourages transmission of bacteria. And speaking of pacifiers, it can become important for your child's dental health to correct behaviors that are initially comforting — including thumb and finger sucking and baby bottles — if they go on too long. In a different vein, adolescent and teenage behaviors can have even more harmful consequences. Tongue or lip bolts and other piercings, chewing tobacco and other harmful behaviors are never healthy and can have both psychological as well as physical consequences.